RAIL-LYNX is developing a range of products to enhance realistic and prototypical operation of a model railroad. RAIL-LYNX is a 255-channel infra red command control system - it provides for cordless walk-around control with all data from the hand held unit being sent directly to the loco, with the track providing only DC power. MU'ing of locos is possible and locomotive addresses may be changed via the hand held controller. without any interference to either system. 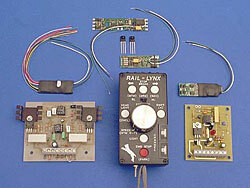 For a full description of the RAIL-LYNX System and its individual components, click on the menu items at the left.